What is the cause of the pauses in this tracing? Is there AV block? Why is the PR interval preceding beat #7 shorter than the PR for other sinus beats? INTERPRETATION: The rhythm in Figure 1 is irregular in a pattern of group beating (with short pauses between beats #2-3 and #6-7). The QRS complex is narrow (ie, not more than half a large box in duration). The underlying rhythm appears to be sinus, with similar-looking P waves showing a fixed PR interval preceding beats #1, 2, 3, 4, 5, 6, 8, and 9 in this right-sided Lead MCL-1 rhythm strip. Despite the presence of group beating - there is no evidence of Wenckebach or other form of AV block on this tracing. Instead - the "cause" of the pause lies within the T waves of beats #2 and 6. The Most Common Cause of a Pause: Although most premature supraventricular beats (PACs or PJCs) are conducted normally to the ventricles (ie, with a narrow QRS complex) - this is not always the case. Instead, PACs (or PJCs) may sometimes occur so early in the cycle as to be "blocked" (non-conducted) - because the conduction system is still in an absolute refractory state. 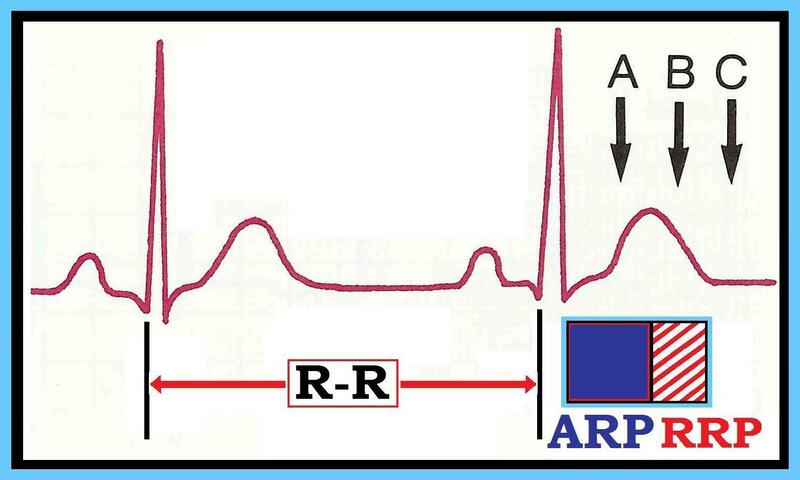 This is the situation for premature impulse A in schematic Figure 2 (which shows A occurring during the ARP = Absolute Refractory Period). why beat A is blocked and beat B conducts with aberration. 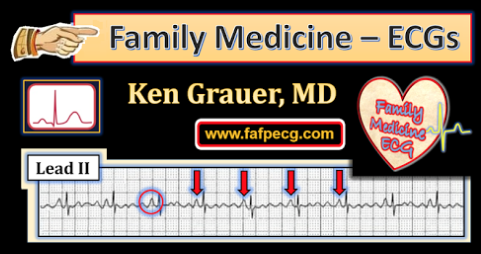 At other times - premature (early) beats may occur during the RRP (Relative Refractory Period) - in which case aberrant conduction (with a wide and different-looking QRS) occurs. This is the situation for premature impulse B in Figure 2. 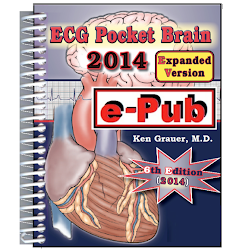 Because impulse B occurs during the RRP - part (but not all) of the ventricular conduction system has recovered. Most often PACs occurring at Point B will conduct with some form of bundle branch block and/or hemiblock (reflecting that part of the conduction system which has not yet recovered). Premature impulse C in Figure 2 occurs after the refractory period is over. As a result - a PAC occurring at Point C will conduct normally (with a narrow QRS that looks identical to other sinus beats on the tracing). KEY Clinical Point: The most common cause of a pause is a blocked PAC (corresponding to a PAC occurring at Point A in Figure 2). Blocked PACs occur much more often than any form of AV block. Blocked PACs are often subtle and difficult to detect. That said - they will be found IF looked for (they'll often be hiding/notching a part of the preceding T wave). The cause of the pause in this case is a blocked PAC (arrow in the T wave of beat #6 highlights the "telltale notching" of a PAC buried in this T wave). A similar very early-occurring PAC (corresponding to a PAC at point B in Figure 2 can be seen notching the T wave of beat #2). The occurrence of a PAC resets the sinus cycle, usually with a brief pause after the early beat. 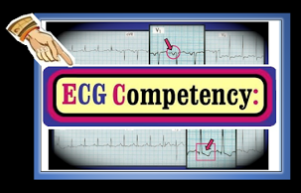 The reason the PR interval preceding beat #7 is shorter - is that beat #7 is a junctional escape beat that occurs just before before the P wave that precedes it is able to conduct to the ventricles. Normal sinus rhythm then resumes with beat #8. Finally - is the subtle finding that the escape interval preceding beat #3 (ie, the distance between beats #2-3) is slight longer than the distance between beats #6-7. This accounts for why beat #3 is sinus-conducted (with a normal PR interval) - whereas slightly earlier occurring beat #7 is a junctional escape beat (that occurs just before the P wave preceding it is able to conduct to the ventricles). Fgure 3 - Answer to Figure 1 (See text). BOTTOM Line: - The commonest cause of a pause is a blocked PAC. Remembering this truism will hopefully remind you to always look carefully in the T wave at the onset of all pauses to see if the "telltale" notching of a blocked PAC is in hiding. QUESTION: Interpret the 12-lead ECG below. What type of conduction defect is present? - Is this LBBB? 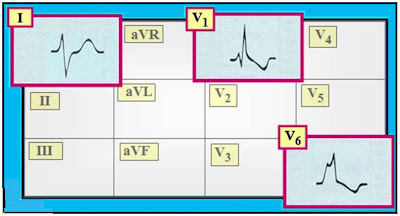 Assessment of QRS Widening: - The 3 KEY leads to assess in order to determine the reason for QRS widening are leads I, V1, and V6. 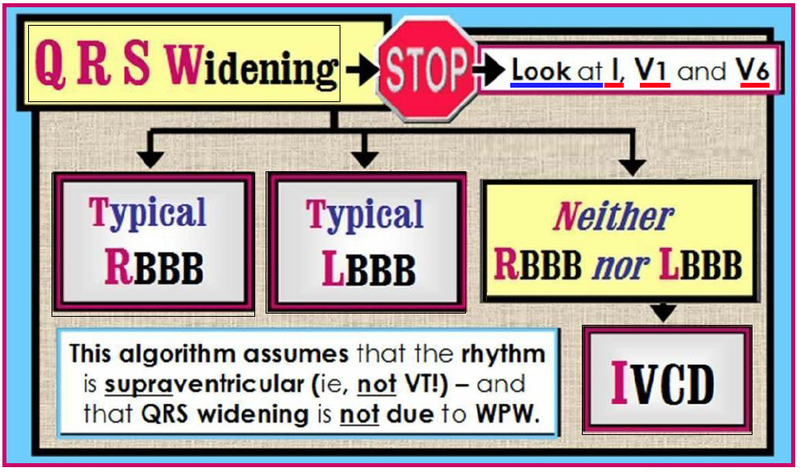 Practically speaking - IF the QRS complex is wide and the rhythm is supraventricular (ie, not wide due to ventricular tachycardia or WPW) - then there are 3 possibilities: 1) Typical RBBB; 2) Typical LBBB; or 3) IVCD (Figure 2). Figure 2 - Assessment of QRS Widening - for which there are 3 possibilities. 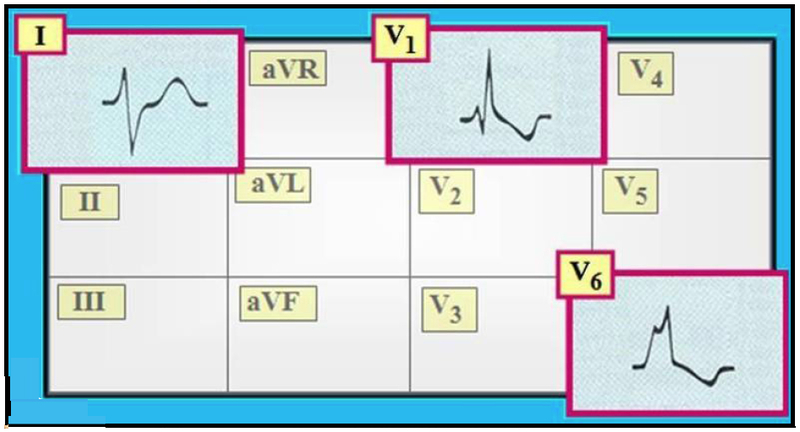 Figure 2 in ECG Review #3 showed the expected morphology for typical RBBB = Right Bundle Branch Block (an rSR' complex in right-sided lead V1 - and wide terminal S waves in left-sided leads I and V6). Clearly, Figure 1 above does not manifest the morphology of RBBB. 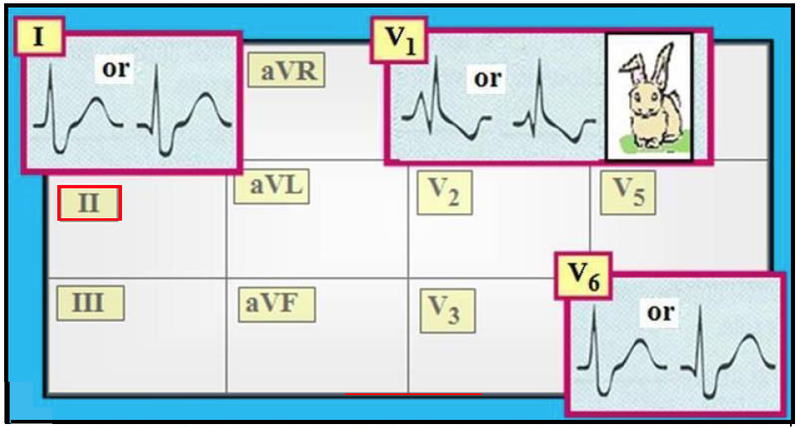 Figure 2 in ECG Review #11 showed expected morphology for typical LBBB = Left Bundle Branch Block (upright, monophasic QRS in left-sided leads I and V6 - and a predominantly negative QRS in right-sided lead V1). Although QRS morphology in Figure 1 above is consistent with LBBB in lead V1 - it is clearly not consistent with it in either I or V6. By the process of elimination - the conduction defect in Figure 1 above is IVCD (IntraVentricular Conduction Delay). 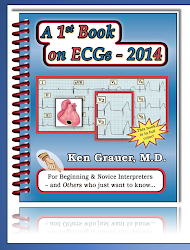 TECHNICAL NOTE: If you right-click on the above links for tracings from ECG Reviews #3 and 11 - you can open these figures in a New Window! The QRS complex is wide (ie, at least 0.11 second). 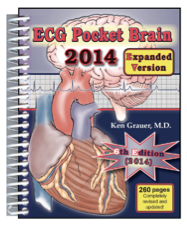 Neither typical RBBB nor typical LBBB is present. Figure 3 - Schematic example of IVCD. 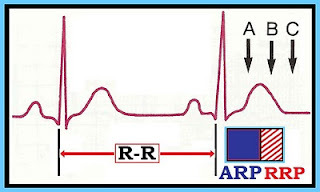 QRS morphology is not typical for either RBBB or LBBB. Thus, in Figure 3 - the rsR' pattern in V1 and the wide terminal S wave in lead I are both consistent with RBBB. However, the notched, upright complex in lead V6 is clearly not consistent with RBBB (but rather with LBBB). 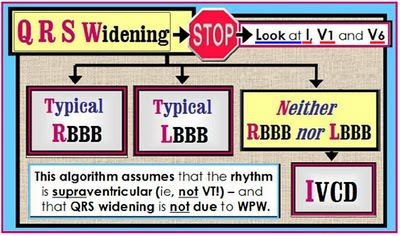 Since typical morphology for either RBBB or LBBB is not present in all 3 of the KEY leads (leads I,V1,V6) in Figure 3 - the reason for QRS widening must be IVCD . . . Returning to Our Systematic Approach: The QT interval is difficult to interpret and less relevant in the setting of conduction defects such as IVCD. 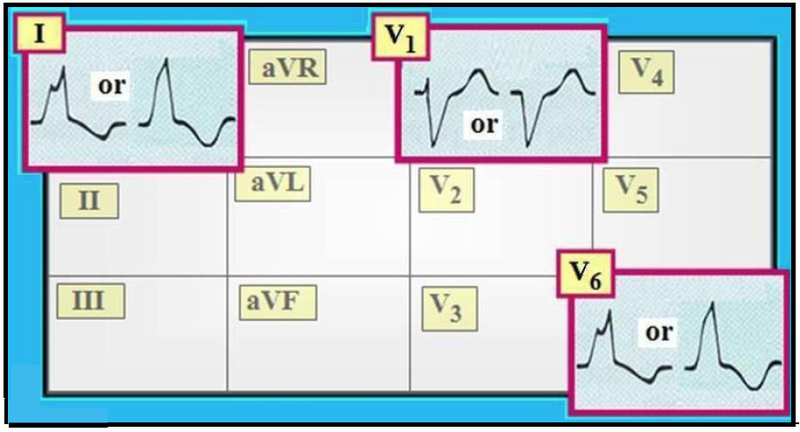 The axis in Figure 1 is indeterminate (negative QRS in leads I and aVF). That said - the concept of axis is elusive with IVCD, and there is really no need to comment on it in this setting. Chamber Enlargement - None that we can call (given the presence of IVCD). Q-R-S-T Changes - Nonspecific changes (Nothing more can be said given IVCD). 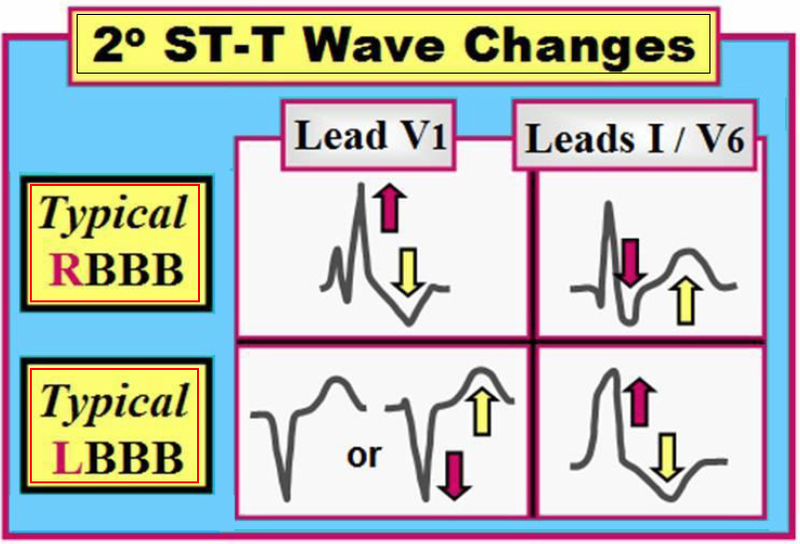 Note - In Figure 3 of ECG Review #11 - we illustrated a KEY rule for assessment of ST-T wave changes with typical RBBB or LBBB (that the ST segment and T wave should be oppositely directed to the last QRS deflection in the 3 key leads). This rule does not work for IVCD. With rare exceptions - it is extremely difficult to assess ST-T wave changes for ischemia or infarction in the setting of IVCD. CLINICAL IMPRESSION: Our final interpretation of the ECG in this case (Figure 1) is as follows: "NSR. Occasional PAC. IVCD. Non-specific ST-T wave changes. Suggest clinical correlation." 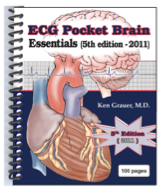 - Please also check out our ECG Video on the Basics of Bundle Branch Block (www.bbbecg.com). QUESTION: The ECG below was one of many in "the pile to be read". It was from a middle-aged adult. No history was given. No prior tracing was available for comparison. The computerized interpretation of this tracing was the following: "Sinus rhythm. Normal ECG." How would you interpret his ECG? — Do you agree with the computer? Clinically — How would you proceed? Figure 1 - This ECG was read by the computer as "within normal limits". Do you agree? INTERPRETATION: The rhythm is sinus at a regular rate of 80/minute. All intervals (PR, QRS, QT) are normal. The mean QRS axis is normal (at +70 degrees). There is no chamber enlargement. Q-R-S-T Changes: — There are small and narrow q waves in infero-lateral leads (II,III,aVF; and V5,V6). Transition occurs early (between leads V1-to-V2). Subtle but real ST segment elevation is seen in multiple leads (II,III,aVF,V1-thru-V6). There is symmetric T wave inversion in lead aVL and to a lesser extent in lead V1. Acute MI (less likely given the diffuse nature of the changes; acute MI is most often localized to a given lead area). Acute Pericarditis (a definite possibility given diffuse ST segment elevation). Early Repolarization as a Normal Variant (a diagnosis of exclusion to be made only after #1 and #2 considerations above are ruled out). COMMENT: — It is sometimes difficult to recognize subtle ST segment elevation (as seen in leads V4,V5,V6 in Figure 1). To assist in this task — it is well to remember that it is the PR segment baseline (Figure 2) that serves as the landmark for judging ST segment deviations (elevation or depression). With this in mind — we can clearly identify the takeoff of the ST segment as being elevated with respect to the preceding PR segment for each of the leads mentioned above. Figure 2 - Use of the preceding PR Segment as a baseline to judge ST elevation or depression. Computerized ECG Interpretations are not always correct (and this case is a glaring example of how they can go wrong). 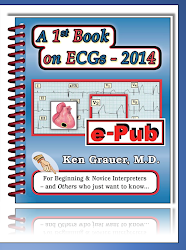 That said - computerized ECG interpretations can have utility IF used correctly (Click HERE for a link to download our pdf Review on "Optimal Use of Computerized ECG Interpretations"). This case also illustrates the tremendous importance of knowing the history. 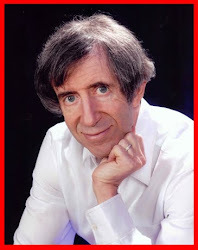 We are literally lost without it — as we have no idea if the patient in question was having new-onset crushing chest pain, having pleuritic-type chest pain with pericardial friction rub on exam — or was entirely asymptomatic. Our clinical interpretation would vary dramatically based on answers to these questions. Having a prior ECG for comparison would also be invaluable for determining if the ST elevation seen here is new or old. As we note above, without a history of new-onset cardiac-sounding chest pain — the diffuse nature of the ST changes makes us less suspicious of acute infarction. That said — each of the inferior leads show q waves with ST elevation, and the symmetric T wave inversion in lead aVL could be a reciprocal change. The onus remains on us to rule out acute MI as a possibility. We would be very suspicious of acute pericarditis - IF the history was fitting (especially if a pericardial friction rub was heard). In addition to diffuse ST elevation — PR segment depression can be a helpful clue suggestive of acute pericarditis — and this appears to be present (albeit subtly) in the inferior leads. Finally - the findings in Figure 1 could reflect a normal repolarization variant. In favor of this is the upward concavity (ie, "smiley") shape to the elevated ST segments (See ECG Blog Review #2 for review of Early Repolarization). In addition — J-point notching is seen in leads V2, V6, and intermittently in other leads. BOTTOM Line: We ignore the computerized ECG interpretation in this case. Small q waves and diffuse ST elevation is noted. History (and ideally a prior ECG for comparison) is needed to know how to interpret this tracing in context. 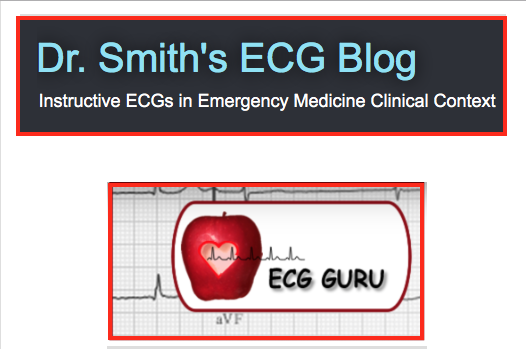 NOTE — For a Review on Use of Computerized ECG Interpretations — GO TO our ECG Blog #126 — Click HERE for a pdf copy of this material.